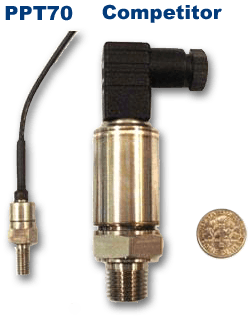 Phoenix Sensor’s unique patented temperature compensation enables superior performance at wide operating temperatures with our PPT70 Miniature Pressure Sensor. 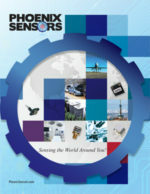 This silicon pressure transducer was designed for demanding industrial and commercial applications. The stainless steel port design allows for pressure measurement of liquid or gas media. The PPT70 series utilizes piezo-resistive pressure sensor pressurized packaged in a stainless steel housing which has superior long term stability and accuracy (.15% Linearity). 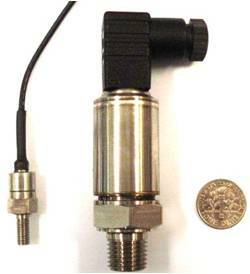 The miniature pressure sensor size works well for medical applications where size and accuracy of the transducer is of the greatest importance. Compressor pumps require small sensor solutions that offer superior performance, which is where Phoenix Sensors solutions fits the bill. The two piece design is simple and proves valuable for OEM customers. Please contact us for Custom design availability.